This is the fifth in the series of films I have compiled from the series published under the rubric of Amazing Places on Our Planet and made by Milosh Kitchovitch. Previously I showed a selection of films from China, Japan, Myanmar and Nepal. The films are made in high, and super-high definition format, and consist of videos taken at various heritage spots around the country, with accompanying and appropriately soothing music. 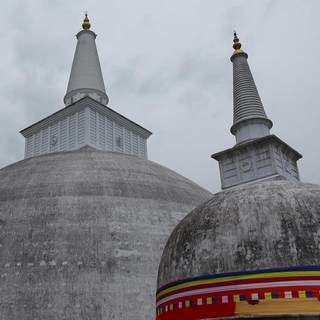 In this week’s selection we start in Anuradhapura, which is Sri Lanka’s ancient capital, and has within its borders some of the most important archaeological remains from the ancient world. We see video made at Ruwanwelisaya, Sri Maha Bodhi Tree, Jetavanaramaya, Abhayagiri and many other places including Mihintale. In the second of the films we visit Dambulla with its ancient caves, sculptures and paintings, which appear to be eerily lit presumably to preserve the paintings from strong and degenerative light. The last of the films goes to the massive rock fortress of Sigiriya and then finally to Pidurangala Rock. It seems a pity that a few of Sri Lanka’s most important heritage sites are missing, at least at present: The Temple of the Tooth in Kandy, and Polonnaruwa being the most outstanding, though there are many others. But still we muct be grateful for Milosh’s fine videography, and having a feel for being in the place.